It is a beautiful cage. Its streets are cobblestone and soft earth, its buildings rise and bloom in spires and steeples and tolling bells. Its people are kind, if distant. Lush, swaying plains extend from its scattered farms, and the sun hangs gently overhead. It is a perfect place to nap through long afternoons, to share moments with friends in sidewalk cafes, or to simply work the day through with the people you love. But the town is a cage. It is not a cage built from malice. 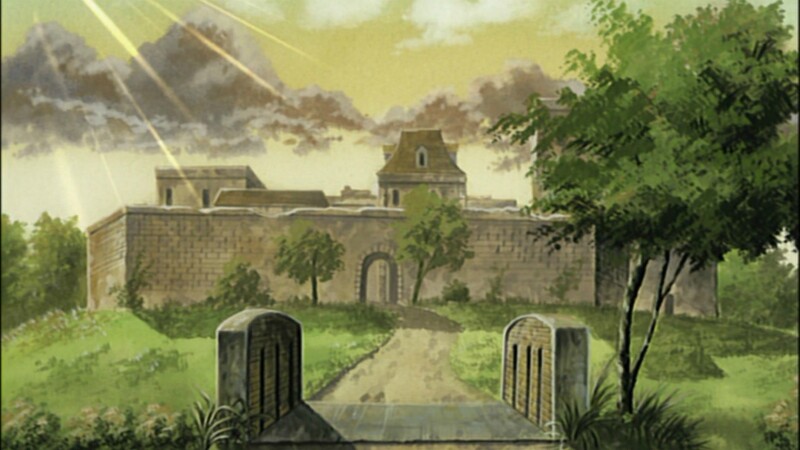 Though the high, distant walls keep the Haibane in, and though they are ultimately being punished, there's no arbiter waiting to proclaim their sin. Their caretaker is unusually kind, in fact - unlike most jailers, he wants them to escape their cage. The Haibane walk with a ball and chain, unable to fly away in spite of their wings. 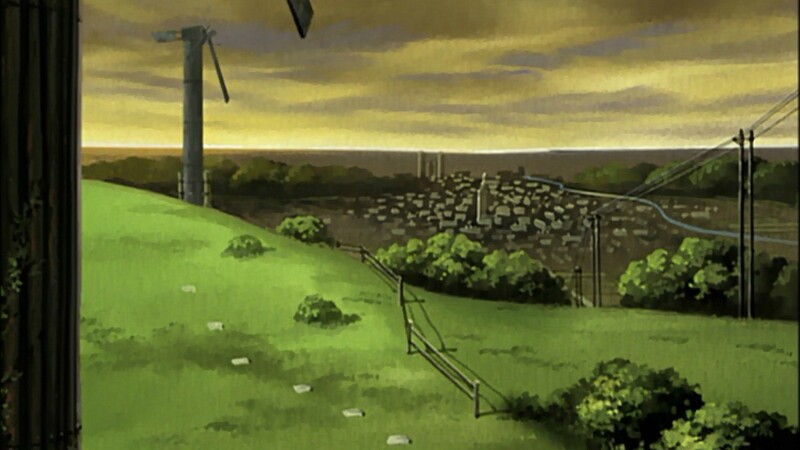 But the irons were set by the Haibane themselves. Haibane Renmei is a story about guilt, and sin, and redemption. Its characters are defined by what they both can't remember and can't forget - a dream that echoes old regret, wings and halos that mark them and set them apart, names that are chosen as tokens of their past sins. They exist in a comfortable, softened reality, and that is necessary for what they need to do. Their ultimate goal is to leave the walls, but first they must pick up the pieces of their own selves, and attain “salvation” or “forgiveness.” This is easier said than done. The town itself presents the first obstacle. In its comfort, in its gentle nature, it provides a necessary degree of stability for the Haibane, but comfort can be a trap. There is always a conflict between the desire for acceptance and the need to acknowledge the self and leave, and this is expressed both in the town's underlying nature and the relationships of Haibane Renmei's characters. The Haibane are coddled by their town, to an extent. The fact that they are dependent on charity is written into their nature - they only wear used clothes, and when asked why they take up jobs, Kana replies that it's “because we are treated like children, so we work to not be indebted to the town.” They are “scavengers,” living off charity like the crows that call overhead, but they are accepted in spite of that. 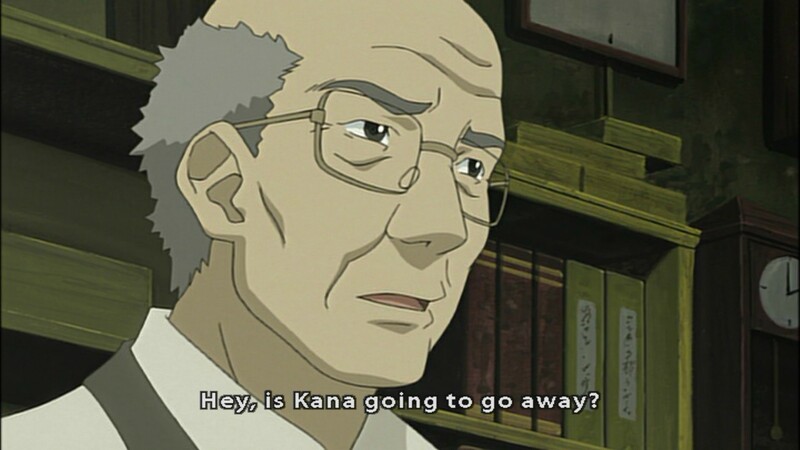 The people of the town can come to care for the Haibane, to the extent where a character like Kana's mentor overtly fears her leaving. 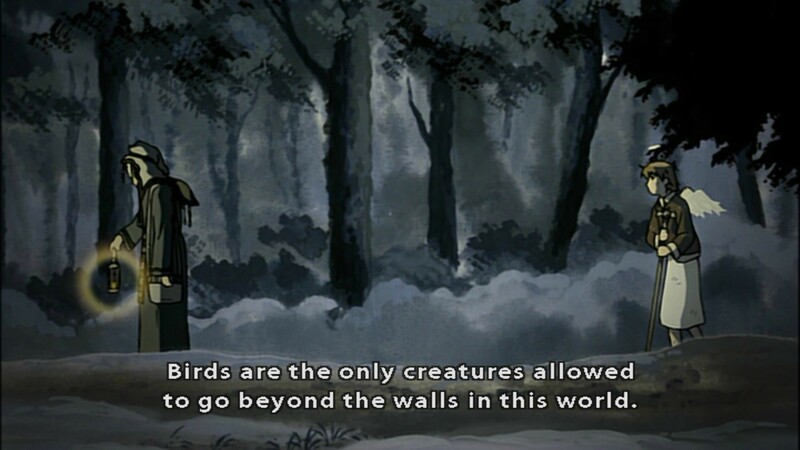 And the idea that the town will claim you if you stay is made clear through Nemu's superior, who once dreamt of finding "the beginning of the world” outside the walls, but eventually found family and contentment within their bounds. Beyond the comforts of the town, the Haibane themselves work to create a warmer home for each other. The show's visual framing does a wonderful job of creating a sense of peace and contentment within Old Home, and the characters that inhabit it all contribute to that atmosphere. 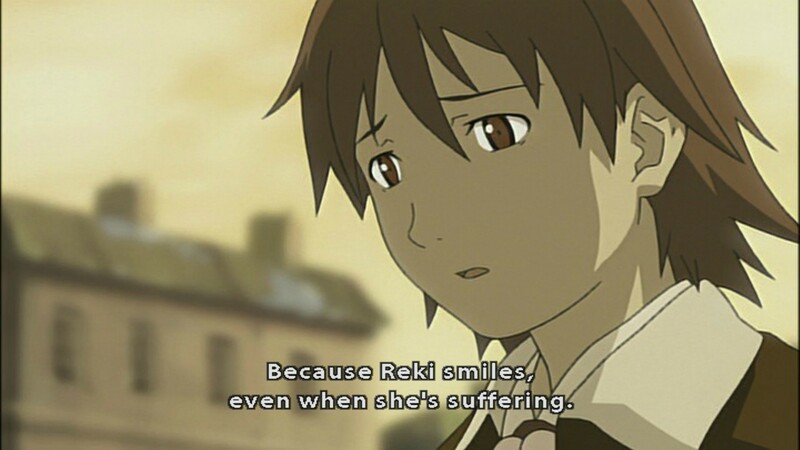 Nemu cares for Reki, Reki cares for Rakka, and Rakka cares for everyone, with all of them standing in the shadows of the Haibane who have come before. They all strive to make things easier for each other, either for their own sake or simply out of their inherent nature. But they cannot carry each other to freedom. Being accepted is important, and can lead to forgiveness, but it's only one step of the journey. As the show says, “if by feeding the birds we create a place where they can survive without any struggle, they'll only inhabit this town and will probably never fly free again.” Redemption can't come without grappling with your sins, and though the characters of Haibane Renmei excel at attempting to carry each other's burdens, forgiveness can't come from others alone. And eventually, being accepted can feel like being pitied - sympathy, like the town, becomes a cage when it coddles you. Reki lives with a constant awareness of that cage, as her stasis slowly moves towards permanence. And so she hides her emotions and smiles, as the beautiful town becomes wintry and cold. “A dream is beautiful because it remains a dream,” but nothing lasts forever, and even beautiful things can come to haunt you in time. “One who recognizes their own sin has no sin.” That's the riddle the guide poses to Rakka, the apparent path out of her own regret. Rakka and Reki both initially take their sin to mean they weren't forgiven by others - that they need redemption from some outside actor, be it the one they wronged or God. But the nature of the Haibane's wings points to the nature of sin itself. They break from the Haibane's back in blood and pain, leaving inescapable scars. When you cannot accept what has passed, they turn black, like the crows, who are shunned by the people because they cannot communicate with them. Cutting the black feathers away does not solve your problem - it is like trying to cut away your sin. But by accepting them, they can become pure white. Still there, because your past never disappears, but ultimately not a stain, but a beautiful reminder. That largely covers the "message" I took from Haibane Renmei, but it seems misleading to leave it at that. Haibane Renmei makes for a pretty classic idea-nugget, given its tightly packed themes, loaded visual motifs, and way of tossing off lines that have at least two meanings (like the “a dream is only a dream…” one). But for all that density, I never really felt that moved by this story - like Yuri Kuma Arashi, I felt it was a little too focused on its ideas as symbols, as representations of events instead of actual events. Sin is always “sin,” being forgiven is a very abstract concept even as the characters themselves conceive it, etcetera - things were a little too intangible and metaphorical even in the show's physical world to land as real. The world, on the other hand, I absolutely loved. I've heard Haibane Renmei was partially influenced by Haruki Murakami's work, and that seems clear in so many elements of this show's construction. The town itself seems plucked directly out of Hard-Boiled Wonderland and the End of the World - the same dreamlike atmosphere, the same provincial feel, the same feeling of purgatory, the same high walls. The well as a story-critical place of rebirth, and the obsession with rebirth itself. Dreams as gateways to new or forgotten truths. Animal as motif and metaphor for the main characters. And even the meditative structure, based around the pace of everyday life. 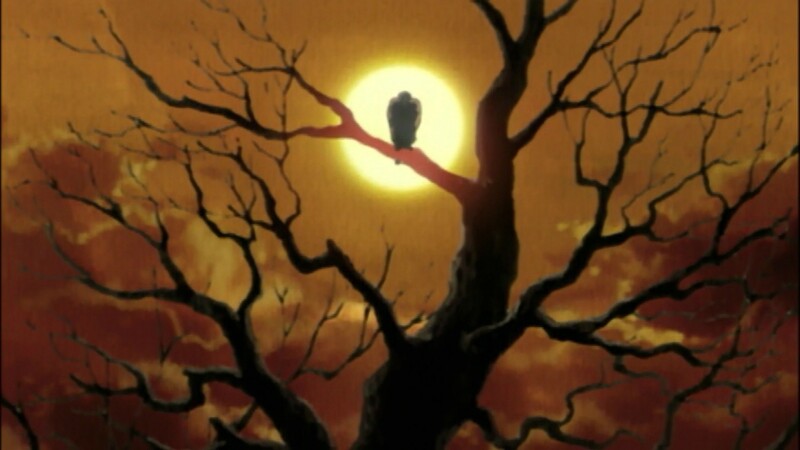 Murakami seems like a pretty common touchstone for anime - while reading The Wind-Up Bird Chronicle, I couldn't help but feel like it could have been a lost arc of Bakemonogatari. I suppose this makes sense - he's a very popular writer, after all, and some of the more atmospheric and structural elements of his work feel like they might draw on broader aesthetic patterns (reflective of the art of the pillow shot, or what Scott McCloud pinpoints in Understanding Comics as a propensity towards establishing frames and aspect-to-aspect transitions in manga) and not be specifically Murakami-esque. 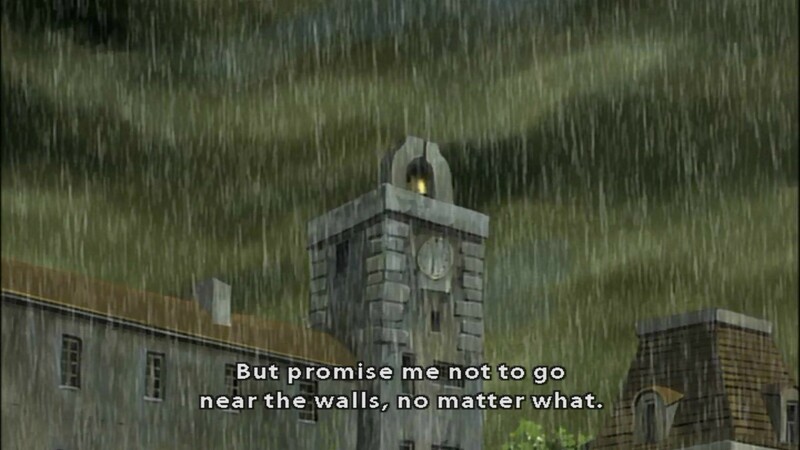 Regardless of its origins, Haibane Renmei stands as a shining example of this type of tonal, environmental storytelling. Its town was evocative and beautiful, a perfect compliment to the story that through its beauty captured exactly why it's so easy to fall into the pace of life in this place. The idea of comfort as a trap is fairly important to Haibane Renmei, and the town made that trap feel real. It's a shame Haibane Renmei is visually hobbled by its era, as the early digipaint aesthetics make everything seem blurred and flat (Haibane Renmei came out right in the middle of the period where anime production was going digital altogether, and the growing pains of being an early adopter are clear in the smudged, low-quality line work of the show's visuals), but the clear beauty of the underlying designs still shines through. 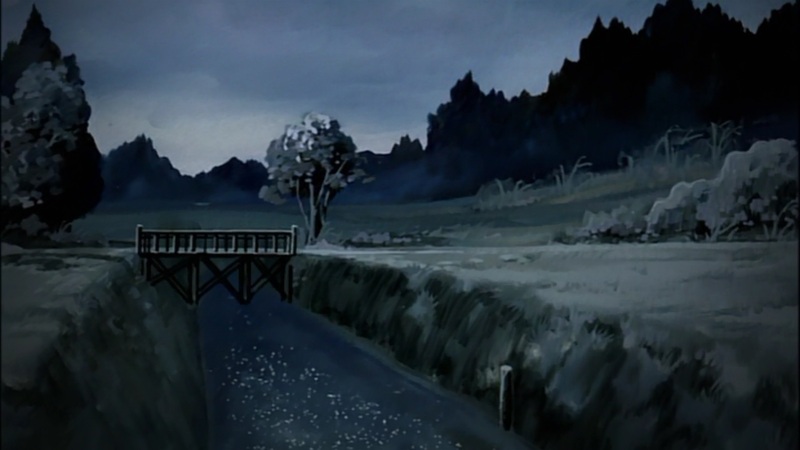 Most of the images I took while watching this show were simple landscape shots - Haibane Renmei was not a perfect show, but it did take me to a truly beautiful place. There are worse places to be trapped with your regrets.